One of the most important aspects of a successful Isagenix lifestyle is the regular completion of Isagenix Cleanse Days. Over the course of your life, your body accumulates toxins and chemicals that can lead to fatigue and weight gain. While your body has natural processes for removing these toxins, some of them cannot be eliminated without dedicated cleansing. Isagenix Cleanse Days flush your body of unwanted chemicals, leaving you feeling refreshed and invigorated. Isagenix cleanse days help assist the body to release toxins and body fat. 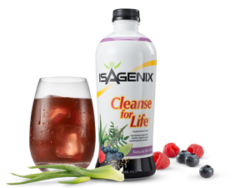 On a Cleanse Day, you will drink four servings of Isagenix Cleanse for Life: once at breakfast, late morning, late afternoon, and at dinnertime. To keep your energy up and maintain healthy blood sugar levels, you may add a small serving of fruit or Isagenix Snacks. Devoting a full day to Isagenix Cleansing will rid your body of unneeded chemicals; you are essentially pressing reset on your internal processes. After completing an Isagenix Cleanse, you should feel increased energy and experience enhanced results from your workouts and diet. Do I Really Need to Cleanse My Body? The benefits of Isagenix Cleansing are clear. Regular cleansing helps to promote weight loss, reduce stress, and boost energy levels. Even after just one cleanse, Isagenix customers report feelings of rejuvenation and stress relief. Once you’ve started this cycle, you won’t want to stop! Consistent cleanses lead to a greater quality of life, and many Isagenix users become hooked on the clean, natural feelings of increased energy and mental clarity. How do You do an Isagenix Cleanse Day? Isagenix have put together an instructional video to guide you through the cleanse day process. Please note in Australia and New Zealand the products differ slightly. For example, we only have 1 flavour of Isagenix Snacks (chocolate), and t+ Chai and Ageless Essentials Daily Pack are not yet available in Australia/New Zealand. 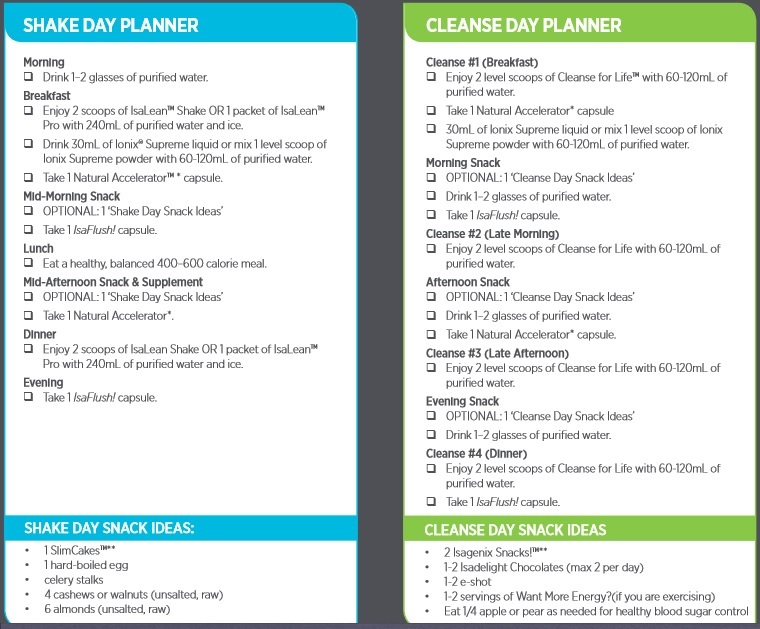 The core of the cleanse remains the same and can be seen in full in the planner below. In addition, the video uses Imperial measurements. The easiest way to find how much water you should drink per day is to take your weight in kg and divide that by 31. For example, if you are 80kg, you would drink roughly 2.6L of water a day. Below is a step-by-step Isagenix Cleanse Day and Shake Day planner. Click image to enlarge. Cleanse days are an essential component to the Isagenix Nutritional Cleansing Program. need to stay hydrated over the course of your Cleanse Day, and the added water intake will help to flush your system of toxins. We recommend a minimum of six glasses of water; eight glasses is ideal! Don’t do too much exercise on an Isagenix Cleanse Day. When cleansing, you should be focused on letting the Isagenix Cleanse do its job. A lengthy workout could leave you feeling lightheaded as you will not have consumed enough food to support your exercise. Save your cardio routine for an Isagenix Shake Day! Stick to the plan on Isagenix Shake Days. Over the course of an Isagenix 30 Day Cleanse Schedule, you will have 4-8 Cleanse Days and 22-26 Shake Days. Because of this schedule, it is critical that you maintain healthy habits on your Isagenix Shake Days; otherwise, the Cleanse Days will not perform their necessary function. Listen to your body. If you feel dizzy, lightheaded, or ill at any point during an Isagenix Cleanse Day, immediately eat something and drink a glass of water. While Isagenix Cleanses are approved for public safety, they can be challenging for first-time users. You know what is best for your body, and you must take care of yourself if your first Isagenix Cleanse Day puts too much of a strain on your system. How Often Should I Do an Isagenix Cleanse? customers leave at least 2 days between cleanses. The frequency of your cleansing should depend on your personal goals. For customers looking to lose weight quickly, we recommend deep cleansing twice a week. Combined with IsaLean Shakes and regular exercise, Isagenix cleanses make it easy to lose weight safely and efficiently. If you are seeking the general health benefits of nutritional cleansing, we recommend regular cleanses between 2-4 times per month. This consistent cleansing will prevent the buildup of toxins and leave you feeling great in the time between Isagenix cleanses.